Rupanyup, a rural town, is at the intersection of the Wimmera Highway and the Dunmunkle Creek, 40 km north-east of Horsham. European settlement in the Rupanyup area was on the Warranooke pastoral run (1845), and closer settlement in the form of farm selections began in the early 1870s. In 1873 the Rupanyup township was surveyed, initially being named Karkarooc, then Lallat (1875) and finally Rupanyup (1876). It is thought that the name was derived from an Aboriginal word describing a tree near a camping place at a swamp, and it is possible that part of an adjoining pastoral station was named Rupanyup. Among the first institutions established in Rupanyup was a Presbyterian church (1874), at which a school was opened in 1875. In less than two months it became a government school. A store and a hotel were opened shortly afterwards. About 1.5 km north of Rupanyup a flourmill was opened in 1873, provoking the establishment of a second settlement, Milltown. In 1877 the Dunmunkle Shire was created, encompassing the townships of Minyip, Murtoa and Rupanyup. Council meetings alternated among them, but the shire offices were located in the Good Templars' hall in Rupanyup. There was also a town water-supply channel cut by the shire council. Rupanyup's chief deficiency was the absence of a railway connection, which Murtoa obtained in 1878. There was to be frequent friction between the two towns, most famously when a council contractor removed the shire offices from Rupanyup to Murtoa at night. Rupanyup's first newspaper began publication in 1878, and a railway spur line was built from Lubeck to Rupanyup in 1887. The line was extended for further short distances beyond Rupanyup in 1909 and 1927. 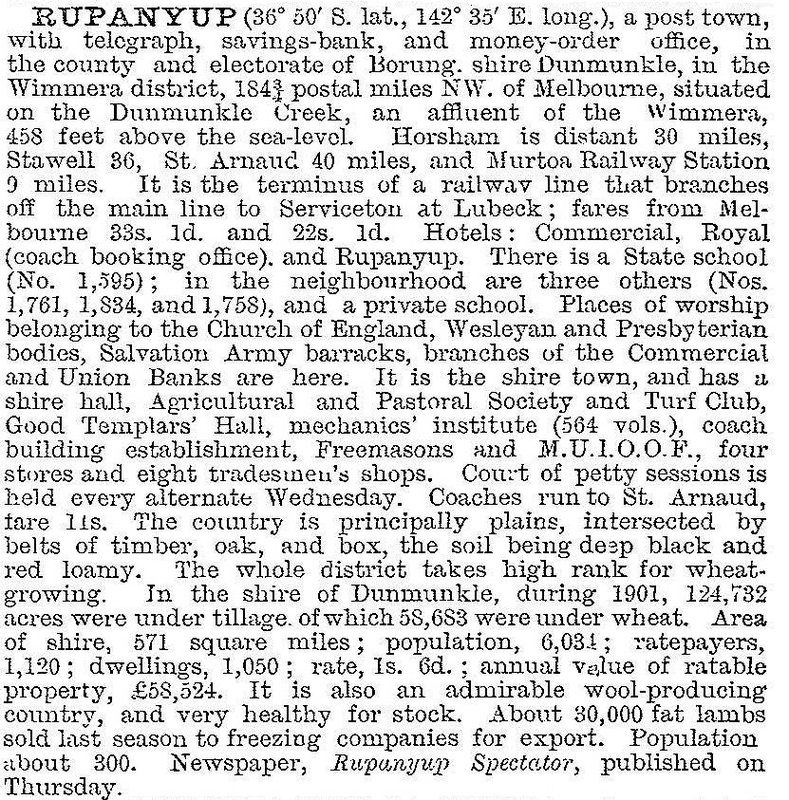 Rupanyup's population was much the lesser of the three towns, but it had three hotels, three stores, and an annual agricultural show by the mid-1880s. After the railway connection in 1887 a second and larger flourmill was opened. It later had the distinction of three reinforced concrete silos (1909), designed by John Monash, probably the first to use that technology in Australia. They continued to be used for grain storage after closure of the mill in 1961. The Wimmera Grain Company, specialising in chickpeas and lentils, started in Rupanyup in the 1990s. Apart from rural activities, Rupanyup had the flourmill which employed up to 20 workers and a foundry and implement works (Acklands) which had a peak employment of 50 workers. A private hospital (1927) was purchased and linked with the Bush Nursing Association in 1948. Enlarged in 1959, it operated for 30 years until becoming a nursing home and emergency holding bed facility in 1988. After 1960 Rupanyup underwent a gradual decline in population, losing about one quarter by the 1990s. The railway line was closed in 1983. Despite the nocturnal irregularities with shire offices, Rupanyup maintained possession of them (and possession of the council meetings in the mid-1930s when alternating meetings ended). Yarriambiack Shire has an office in the former Dunmunkle municipal office. Rupanyup has golf, bowling and football clubs, tennis courts, a swimming pool (1986), a primary school (43 pupils, 2014), Anglican, Catholic and Uniting churches, a nursing home, a showground, a public reserve and a hotel. The railway station is used for community purposes and is on the Victorian Heritage Register. After the town's three banks closed, the first of a network of Bendigo Bank's community banks (shared with Minyip) was opened in Rupanyup in 1999.